Christy Barritt wrote an engaging story in her Christian romance suspense title, Home Before Dark. It was my introduction to her writing; I must say she drew me into Daleigh's world - a burned out singer who had just buried her father. Heartbroken and disillusioned, yet preparing for her return to Nashville, she decided to take one last look at her father's room - only to discover a journal which made the hair stand on the back of her neck. Was her father's death an accident as everyone supposed or was there something more sinister afoot? In spite of the claims others make about Daleigh having a vivid imagination and stirring up trouble, she can't ignore her instincts. After her brakes give out, she learns the brake line was cut; in her mind, it confirms her questions are bothering someone enough to try to kill her. 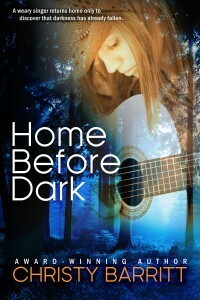 Daleigh's father always told her she should be home before dark, that only bad things happen at night. Even so, pairing up with Ryan, a mechanic who admired her father, Daleigh will not give up until she knows exactly what happened on the fateful day her father died. Little did she know how right her father was; the question is whether or not she will survive to tell the tale. A must-read with other stories on the side involving estranged sisters trying to find their way back to each other and a paralyzed boy who has more hopes and dreams for the future than most children will ever have.